Delicious desserts made with blueberries for the blueberry lovers out there. I was searching for blueberry pie and noticed your cookbook on one of the recipes. GREAT idea and wonderful uses for blueberries. Thank you! :) Hope all is well with you Karla !! and your family ! Thanks for including my recipe. I have several of those saved...lol but it's nice to have them all together! Oh yummy, yummy, yummy, yummy, YUMMY! Thanks for another great book, Karla! Karla, you design the most beautiful covers. 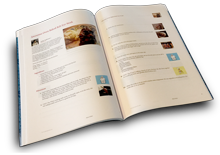 I am proud to be included in your cookbook.